Laid back pub in a sea of poshness. 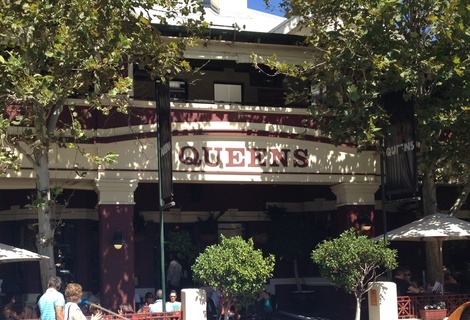 The Queens was reviewed on Sunday 5th February 2012 12:15 by Richard. The one and only decision I regret when reviewing The Queens, was choosing to drive there. Partly due to the lack of parking but mostly because it was such a great day, I wanted to stay for a lot longer than we did. The weather was perfect for a Sunday session, not a cloud in the sky and not overly warm. My friend and I headed down Beaufort St to The Queens for an early lunch and a few frothies. We got there just after midday and already the crowd was starting to build. The floor space is used really well and there is a range of seating options throughout the pub, tables in the inside ‘bistro’ area, long benches and high tables in the court yard or one of the other tables scattered throughout the pub. If you’re planning on heading down with a large (6+) group of people it may be worth while reserving a table in advance. 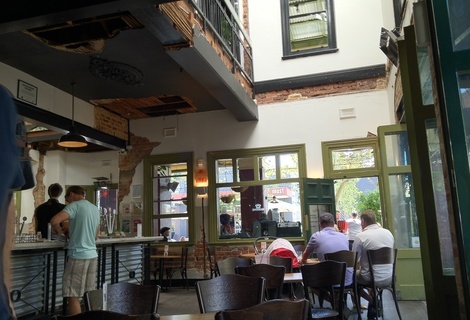 The fitout/decor is brilliant and really adds to the rustic vibe of the place. It’ll leave you wondering if the cracks in the walls and ceiling are real or if they have had some major renovation budget cuts over the years. The high ceilings and large sliding doors give the place a lot of natural light and a sense of openness. The bar was well staffed and both bar and table service was fast and for the most part friendly. Our table waiter lacked enthusiasm and was quite blunt but friendly enough. There are over 20 beers and ciders on tap which is pretty impressive these days and the wine list is not too bad either, with mostly local (Margaret River) and a few kiwi varieties on offer. The everyday drink specials were a hit and we had more than a few $5.50 XXXX summer lager stubbies. Our food took less than 20 minutes to come out and the full table service is a nice change from eagerly awaiting a buzzer to prompt you to collect your food. 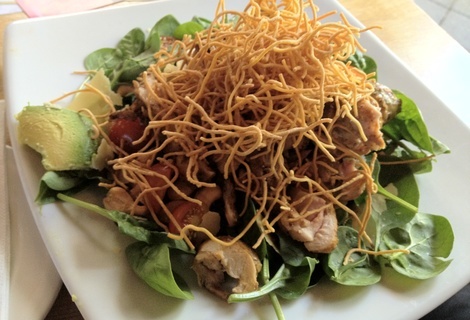 I ordered the cajun chicken salad, which was great, the chicken had a zesty Cajun marinade and the crispy noodles and cashew nuts gave it an amazing crunchy texture. My only complaint would be that it was a touch dry and I think it could’ve benefited from either having more dressing or even some lettuce (iceburg or cos) as there were only spinach leaves which have very little moisture when raw. 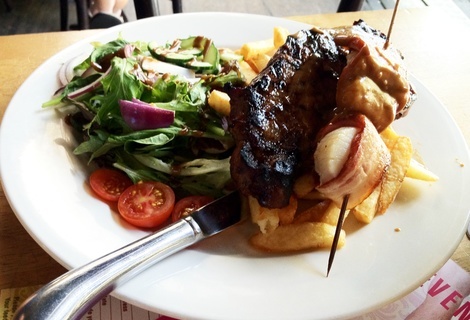 My friend had the Monthly steak special which came with 3 bacon wrapped scallops. The quality Graziers Porterhouse was cooked exactly how it was ordered (medium rare) and the Dianne sauce complimented it nicely. The salad was quite pricey at $27 (same price as the steak special) but it was worth it both in size and quality. Overall the meal, including drinks, was great value for the quality and service provided. We were really enjoying the live reggae style chilled out music being played by the Grace Barbe Band (www.gracebarbe.com/) so we decided to stay and have a few more beers. The Queens has a pretty young, relaxed crowd including young families. The dress code is pretty relaxed too, considering its trendy location on Beaufort St, which helps add to the laid back vibe of the place. I will definitely be going back to The Queens for another Sunday session and I’ll make sure I leave the car at home. 7/10El Publico in Highgate, WA (36m away)Modern Mexican small bar with more tequilas on offer than you could throw a donkey at. 8/10Five Bar in Mount Lawley, WA (127m away)One of Beaufort Street's best small bars.